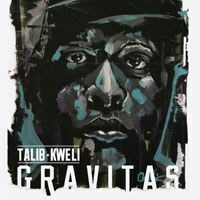 Although there are a few moments that lack the edge of his debut, Gravitas is a welcome return to form -- of sorts -- for Kweli. I remember coming across Talib Kweli's solo debut, Quality and thinking to myself that I had finally found a rapper that didn't care about making $1,000,000 and going platinum every day. Kweli just wanted to make music that worked. Music that worked extremely well. And that's what Quality had going for him. Nobody cared about the fact that it didn't win him a single Grammy nomination, or that it failed to make the top 20 in the Billboard 200. That didn't matter because when "Get By" comes on, all the hip hop heads know that you just decided to take it back. When an album as great as Quality is released, you face a real problem. Kweli was in the dilemma that Lauryn Hill and Nas faced. When you create an album that redefines a genre, you can either drop out of the industry, like Hill, or continue with releases that don’t compare, like Nas. Kweli decided to follow Nas’ example and never really managed to reach the critical heights that he reached with his debut. However, he managed to garner more attention and even enough traction to accomplish a run of albums with high-profile producers. Sometimes it takes a lot less in order to gain a lot more creatively. And even though Kweli hasn’t been the most famous rapper at any point in his career, on Gravitas he’s definitely reclaimed his throne as one of the best story tellers in the game. Case in point: “State of Grace”, which tells the story of a girl who used to be in love with hip hop music but is no longer interested, whilst telling another story about the decline of hip hop music itself. Kweli manages to intertwine both stories and feature Abby Dobson, rather than a typical chorus girl, on the chorus like a beautiful sample. What makes this song even better is the complete honesty that is addressed by Kweli along with an updated ‘80s influenced instrumental. It is very interesting to note how much Kweli decided to embrace the production that dominated his first album: laid back neo-soul mixed with fairly gritty hip-hop. This is most apparent on tracks like “Rare Portraits” and “Inner Monologue”, both songs giving the listener an insight into Kweli’s mind and history, respectively. Kweli, as usual, manages to tell his story very well without sounding corny. At times, though, the production and arrangement doesn’t spell innovative, to say the least. “New Leaders” is a classic example. I completely understand why a track like this suits Kweli, but I don’t really understand why he opted for an extremely annoying and repetitive chorus of “Got enough / Followers / Now I’m looking for some new leaders / I’m looking for some new leaders” etc. The production also sounds like it was pulled from an Eminem or Jay-Z album. The entire arrangement hangs on a sing-along choir and a rock-influenced beat. The following track, “The Wormhole”, doesn’t help Kweli’s case either. Opting for another rock-influenced track, he dives into addressing the whole Illuminati theory surrounding pop music by asking if we want to get deep. No, it doesn’t intrigue me. But then the lyrics don’t inspire much hope in resurrecting his critical appeal (“You can lead a man to a drink / But you can’t make him take a sip”). J Cole did the same thing on his sophomore album with the track “Villuminati” and it is executed smartly. The most horrific track on the album by a mile is easily “What’s Real”. Nothing is worse on Gravitas due to the banal production, which sounds like it was stolen from a recent Lil Wayne recording session, along with a boring chorus that defines the very worst in hip hop (“What’s Real / Do you know / What’s Real / Lemme show ya”) repeated over and over again, along with lyrics like “We’re like Shia LaBoeuf / So Lawless,” “You are what you eat / You don’t want no beef” and “Crazy / Borderline / Pay Me / On time.” It’s the braggadocio, narcissistic type of rap that people associate with things that should not even be mentioned in this review. But for all the missteps that are made on this album, there are gems to be had without Kweli sacrificing creativity and yet also catering to those who only care for Top 40 rap. Such can be found on tracks like “Art Imitates Life” and closer “Colours of You”, which reminds me instantly of an Erykah Badu track I can’t put my finger on. Besides the digression, Kweli closes the album with an unlikely yet brilliant feature in Mike Posner. His voice isn’t powerful, but it’s soothing and Kweli sounds focused on delivering a track about love. It’s a topic that Kweli doesn’t delve into much on this album, but it is most welcome. And that’s really how to best sum up Gravitas. It will never reach the dizzying heights of any previous albums, nor will it gain the critical appeal of his debut. However, Gravitas was, at the very least, one of the better albums released in 2013. Many will never regard this album as a hip-hop highlight, but I personally believe it signals a return to form for Kweli. Here’s to hoping he can reach the creative peak of his first album with his next one.